This song was written for a 1927 British revue called Clowns in Clover. 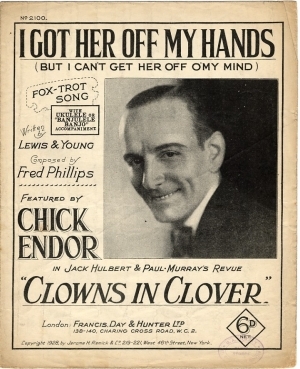 The first recording of “Got Her Off My Hands” was by Chick Endor in 1928. I can’t get her off my mind. but now I’m the cry-in-est kind. I can’t get her out my mind. “Got Her Off My Hands” was recorded on April 24, 1963 and released in 1963 on the album This Is All I Ask. It was arranged by Ralph Burns.